When it comes right down to it, there are three fundamental rules regarding food and weight loss: choose a variety of healthy foods, eat 4-5 times per day, and drink plenty of water. In this article, we’ll focus on the first rule, but with a bit of an edge. We’ll talk about foods that will make you lose weight fast. While it is true that avocados are high in fat, nearly all of it falls under the “healthy fats” umbrella. Two of the three fats – monounsaturated and polyunsaturated – are considered healthy and comprise 85 percentof the avocado’s fat content. Avocados also contain anti-inflammatory properties. Additionally, these properties help stabilize blood pressure, lower “bad” cholesterol levels, and lower the risk of heart disease. Broccoli contains the “one-two fat loss punch”: low in calories and fat, and loaded with dietary fiber. Put simply, despite being a rather plain food, broccoli will fill you up and help you lose weight fast – without added calories. Broccoli also contains a bunch of minerals, nutrients, and vitamins, including vitamin A, B2, B6, C, and K, folate, magnesium, and protein. Omega fatty acids will help you lose weight fast. Mechanically, the omega-3 and omega-6 fatty acids in chia seeds stimulate fat burning. They also activate enzymes that transport fat to be used for energy. More fat used to power cells means less fat stored in the belly! Chia seeds are also loaded with fiber. 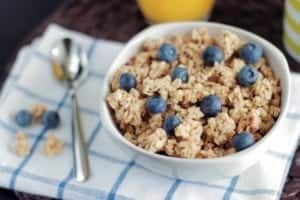 Just two tablespoons contain 10 grams of quality fiber or 40 percent of the recommended daily allowance (RDA). They help you to lose weight fast. Cranberries are packed with vitamins and minerals. Also, the drink’s ursolic acid makes the cranberry a potent fat-fighting food. Ursolic acid, in numerous studies, demonstrates an ability to stimulate muscle growth, accelerate metabolic rate, and burn fat. You only need a handful of cranberries for weight loss. Watch out for some cranberry drinks, because they often contain added sugars. Let’s put this to rest once and for all: eggs are not bad for you! We have seen more flip-flopping about the healthy (or unhealthy) nature of eggs than about any other food. Not only are eggs healthy, but they are also considered a “superfood,” meaning that they’re brimming with nutrients. In terms of weight loss, studies show that eating eggs for breakfast stabilizes insulin levels and curbs hunger, which will help you lose weight fast. Here’s another food where scientists don’t seem to know what in the heck is going on at any given time. Fatty fish (e.g., salmon, mackerel, etc.) are awesome for weight loss. Rich in omega-3s, fatty fish provide quality protein, necessary to curb the appetite and build muscle. Try having fish as an entree at least once per week. Your brain, heart, and tummy will thank you! A groundbreaking 2004 study conducted by the Nutrition and Metabolic Research Center at Scripps Clinic in San Diego, California, found that adding grapefruit to one’s diet can ramp up weight loss in a serious way. Eating half a grapefruit before each meal or drinking a serving of grapefruit juice three times a day helped participants lose an average of 3.6 and 3.3 pounds, respectively. Many of the study’s subjects lost more than ten pounds over a 12-week period! Packed with fiber, lentils also contain a fair amount of protein. For vegans and vegetarians, lentils (along with soy) are two of the better plant-based sources of protein. Lentils serve as an excellent fat-loss food because they stabilize blood sugar and are slow to digest. This means that you’re prone to fewer cravings and will probably eat less throughout the rest of the day. Similar to lentils, oatmeal also takes a while to digest while helping normalize blood sugar levels. Oats contain a viscous gel formed by the submersion of soluble fibers, which helps to promote healthy digestion and lower cholesterol levels. Oatmeal is also incredibly versatile in that you can add pretty much any fruit. Add some sliced apples for a serious weight loss combo! Eating foods that are flavored with black pepper or chili pepper may boost your metabolism by more than 20 percent! Researchers believe that spicy foods help you lose weight fast by increasing body temperature – a process known as thermogenesis. Eating spicy food may also help promote satiety or the feeling of fullness. The active ingredient of chili peppers, called capsaicin, may also reduce LDL (“bad”) cholesterol levels and reduce inflammation.